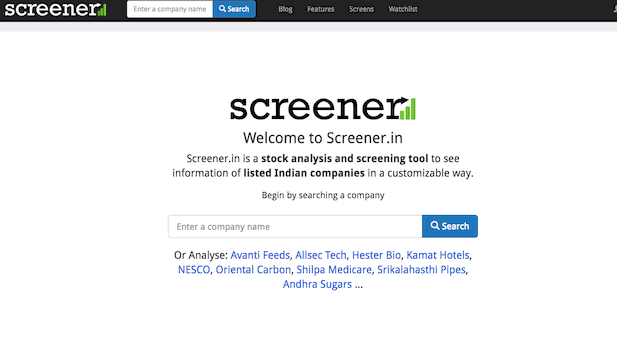 / What is a stock screener? Software based or website based: which one is best? A stock screener is a must-have tool for both investors & traders. In Indian stock market alone, there are more than 2000 companies listed at NSE & BSE. Unless you are full-time investor or trader, you don’t have enough time to keep an eye on all of them. This is extremely difficult for even full-time market professionals. This is where a screener comes into the picture. This tool helps you to filter stocks based on your metrics. How does a stock screener works? A share or stock screener is basically designed to give you multitude of filters that you can use to screen stocks. For example, let’s say you are a long term investor. Now, you can be using many of the popular fundamental analysis parameters to find out worthy stocks. Very rarely there is a single company in any sector you want to invest into. Once you have identified certain sector to invest into, you need to narrow down on the stocks in that sector. This can be the minimum market cap of the stock, certain ROI (Return on Investment), certain number of quarters in profit or any of the many other combinations. Each such parameter that you use to scan stocks is a filter. A share market screener works to solve this issue. You define your parameters from the choices provided by the screener and set it up to send you alert whenever your conditions are met. 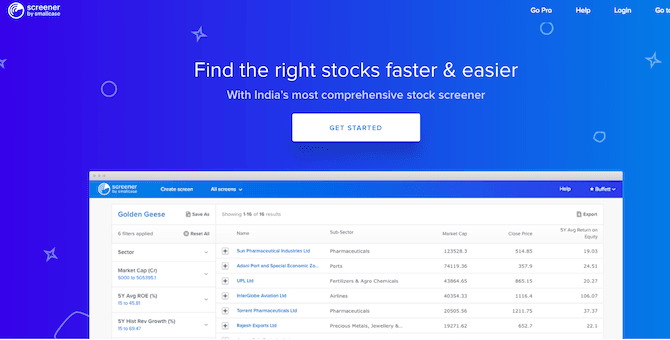 Stock screener: is it useful tool for investing? Just like charting services, stock screener is also a developed tool over time. A stock screener earlier used to be the tool only for technical analysis, and that too based on charts only. You can still see it on charting software like Amibroker or on Forex trading platforms. These tools also provide choice to even code your own trading system based on these filters. Well, not any more. Now, a screener is popular tool among long investors too. Whatever your investing philosophy, there are certain parameters which are core to that philosophy. This is where this tool is useful. Then you have professional premium services like screener by small case, chartpick.in, screener.in. There are many more but here we are more focussed on how to use this tool for your benefit. Any service which provides what we need is good enough for us. So try a couple of them and choose one. Then you can focus more on making best use of the service. Though you can guess, I will still mention. If you are a trader and working on making that as your income source, a desktop software goes a long way in backtesting your trading system. Alert help you in refining your trading system as it takes care of emotional part of trading. For an investor though, online stock screeners are the best bet. What you are more focussed on is finding a good investment. That requires research. A screener can easily send you alert when it is triggered. Then you can sit down and research more & decide to either invest in the stock or discard it. A software based service has the option of coding. Which means you can actually customise it to a much deeper level. But, frankly, you don’t need such level unless you are trading at such levels. Normal triggers are the best. This question is little difficult to answer. To get a fair idea, I (and couple of friends) signed up with nearly all the top listed stock screeners for Indian stock market. The good thing is nearly all of them provide certain features free of cost. In most cases, free features are sufficient. And what we found is except for few of the services being more of lip service as compared to what they offer, they all are quite competitive. Each platform provides exhaustive list of features in their service. So much so that it can be confusing at times. Smallcase is a Rainmatter backed company. This fintech company came up with the idea of simplifying investments by providing thematic investment services. The screener is an additional independent service offered by Smallcase. This one got referred to us by two different traders. To be clear this is more of trading oriented desktop software. 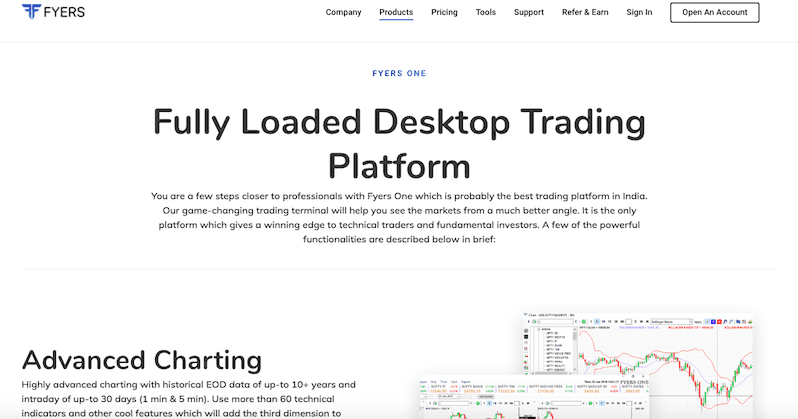 Competing in the already competitive market of discount brokers, Fyers is putting the best of market features in the software. And, it shows. The interface is clean, easy to understand and works well. We didn’t face any glitch with the backend for the duration of our testing. Though most of my interest lies in investing now, time to time I like to trade in short to medium term opportunities. I use proper technical analysis tool like this trading platform for scanning such opportunities. I found Fyers One to be quite good for such use. This is a technical analysis website, through and through. The interface is quite loaded. And to any newbie, it will feel overwhelming. Especially, the ‘today’s top trending scans’. But once you get used to it, this is quite a fascinating website. Again, loads of data. Very exhaustive. Going through the list presented by your screener makes it quite tempting to trade on couple of ideas. Please, refrain from doing so. A screener is a tool, just like all the other tools you will use to improve your investing ( and trading skills). They are not your decision maker. So, whenever you get an alert, analyse and see that it fits into your investing or trading style.